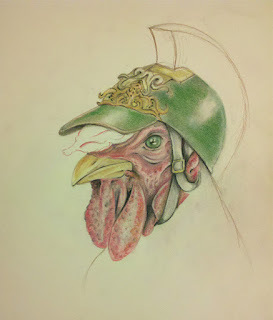 Creative process for my rooster drawing wearing a victorian military helmet. 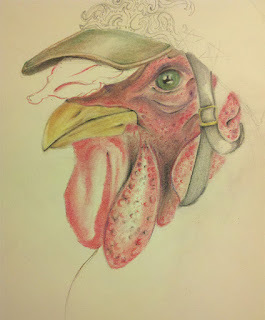 I didn't get to capture the sketch but I already sketched out the bird earlier and didn't get a chance to document it. 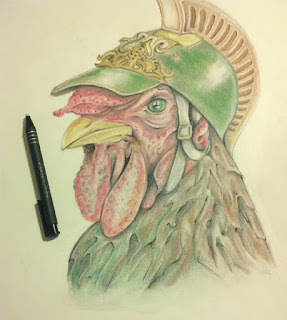 So here the first image, I've simply blocked in the face with the colors of the rooster seeing where the light hits on his gobbler thing. I had to find a way to give texture of the bumpy surface so I gave it a little style and made it a little bigger so it looks like chicken pox! 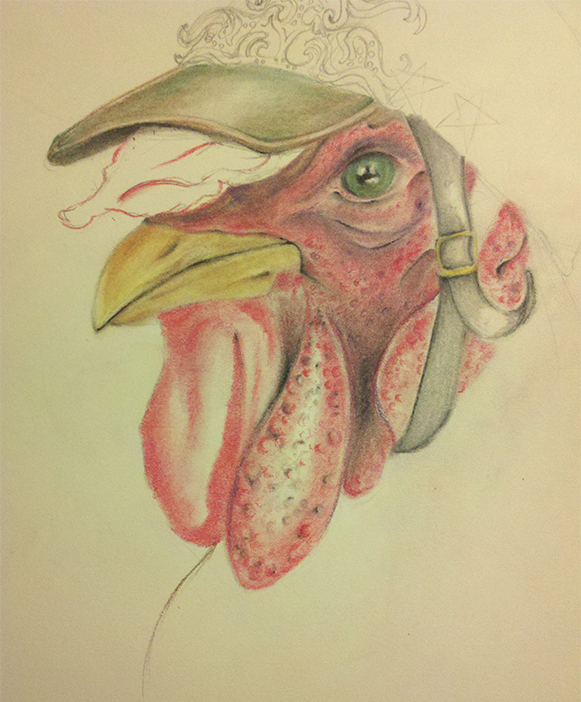 I've used a range of colors on the rooster's face: red, violet, navy blue, orange, peach all makes up for the rooster's skin tones. 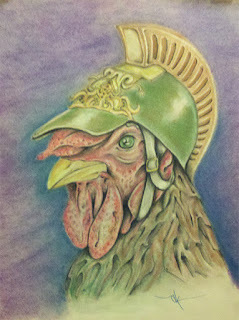 Fourth image below, I blocked in the mohawk thing on the helmet and colored in his body. 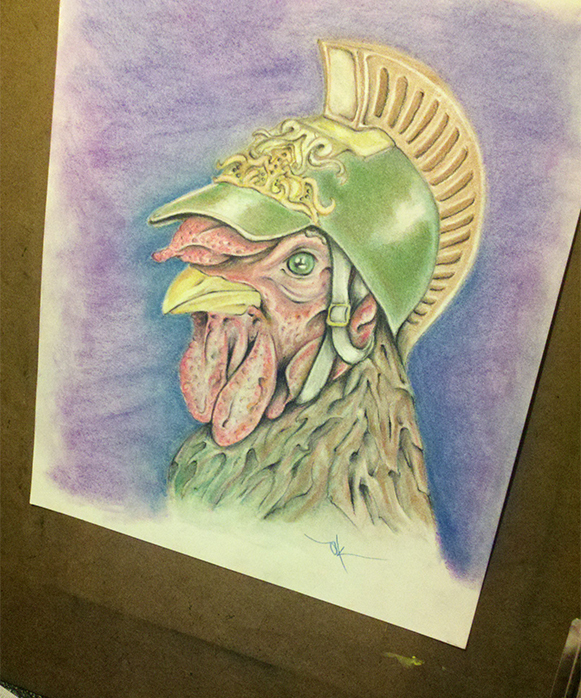 His body was tricky, I have little experience when it comes to feather and fur, so I just did it my way which I think added some character to the rooster beast. Colors consisted of: Green, brown, navy blue, and red. 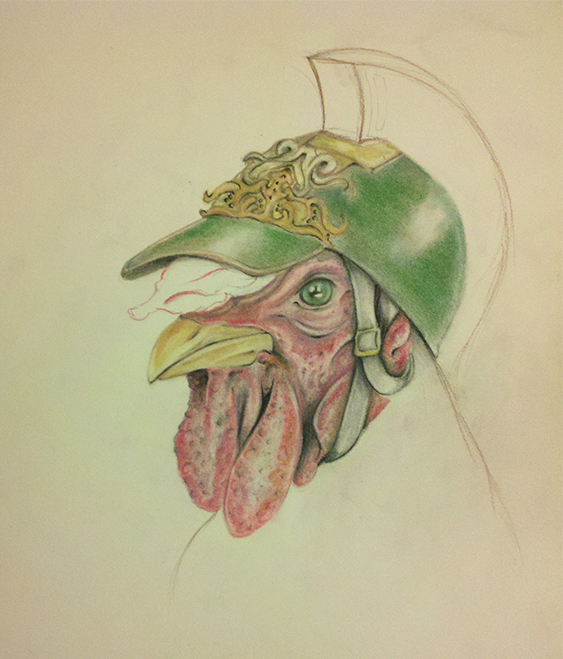 Fifth image below, Here I darkened some areas doing final touch ups on the helmet, face and fur. Also obviously adding a background. I wouldn't worry too much about the white area below the drawing since it will be matted covering most of the white. I will probably color in a little bit of the feathers around my initials though. Hope you enjoyed this drawing! 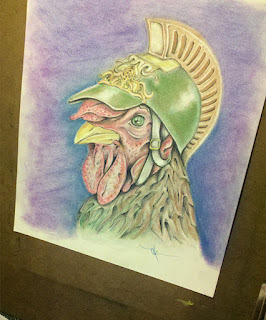 As for the title, I had to choose between Colonel Sanders or General's Chicken.